“I’m really, really high, and I want to lie down,” the first student said. “It’s Halloween weekend,” said another. 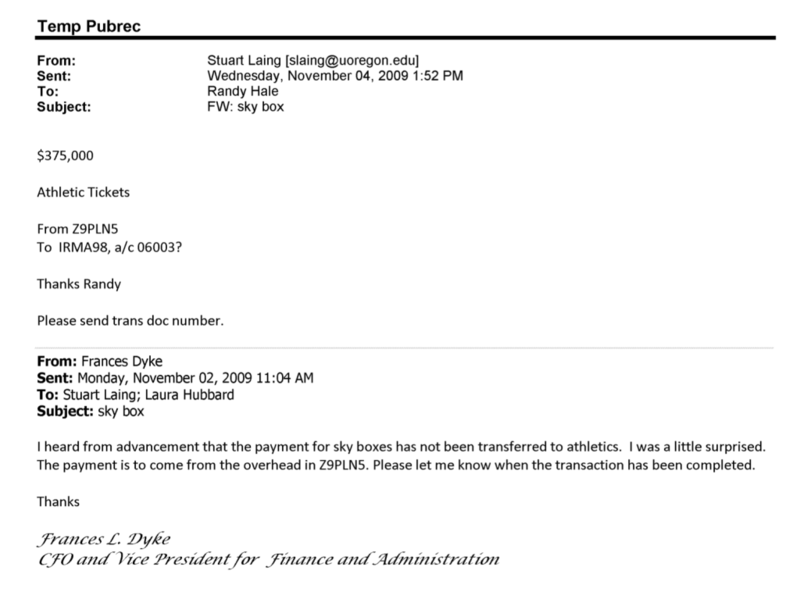 Which does raise the question of why the ASUO is paying Rob Mullens, Eric Roedl and the Duck sports enterprise $1.7M for “free” tickets. More on that here. Not bad compared to student attendance at Dana Altman’s basketball games. Altman to give a lucky UO student his shoes for watching tonight’s UW game! 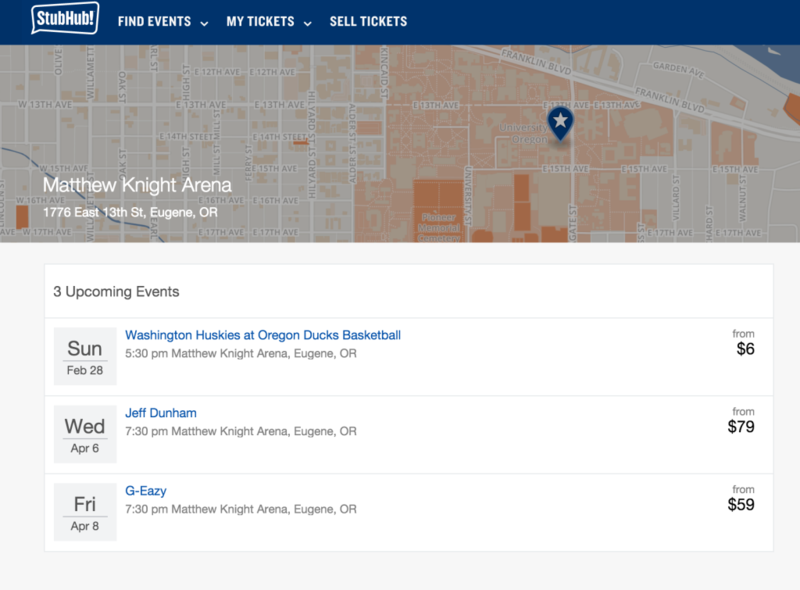 One of our student readers reports that he got an email saying Dana Altman will give away a pair of his stash to some lucky student at tonight’s game, as thanks for the $1.7M in mandatory student i-fees that ASUO pays the Ducks for tickets. For more on UO’s lousy apparel deal with Nike, read Matthew Kish in the Portland Business Journal. The Senate legislation is for ~$3M recurring. The coach’s charitable drive is for $500K, one-time. 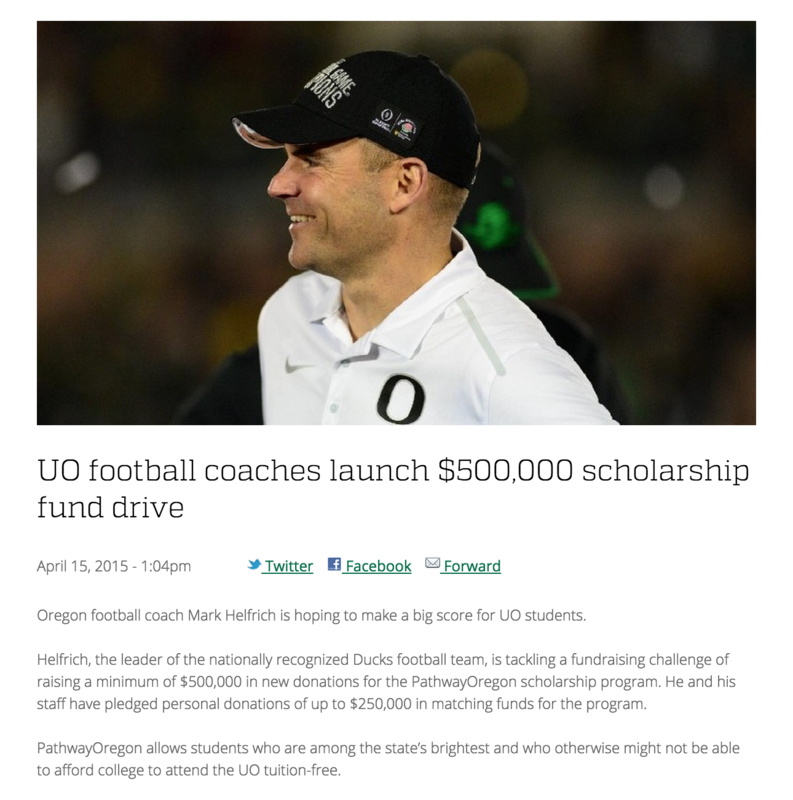 If ASUO can’t break tie, Duck Athletics will get $0 from students. It turns out the ASUO committee tie-breaker vote reported below was disallowed. They are going to meet again Tuesday 8AM (in the Rogue River room, I think) to try again. Presumably AAD Eric Roedl will be there, hat in hand. If the committee can’t come to an agreement, the athletics department will get $0 from ASUO, although they’ll still get the millions in other subsidies described here and below. AD Rob Mullens will then have to decide if he wants to cut the UO students off from access to the Autzen Stadium Student Section, or take other steps to limit student access to Duck games. Which would be political suicide for the Duck Athletic Department, so presumably the AD is engaging in some heavy student arm-twisting this weekend. Of course Mullens couldn’t implement the nuclear option without the approval of Interim President Scott Coltrane. So, what do you think readers? 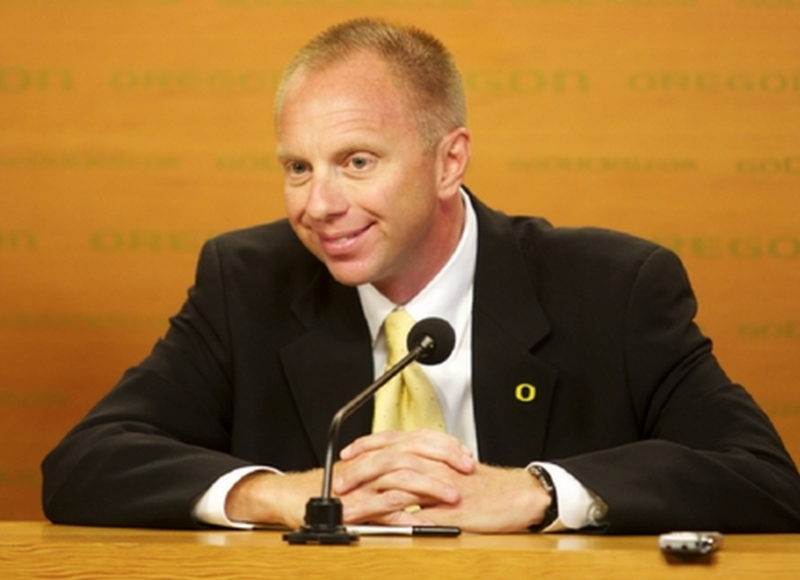 What are the chances Scott Coltrane would let Rob Mullens cut the number of student football tickets? 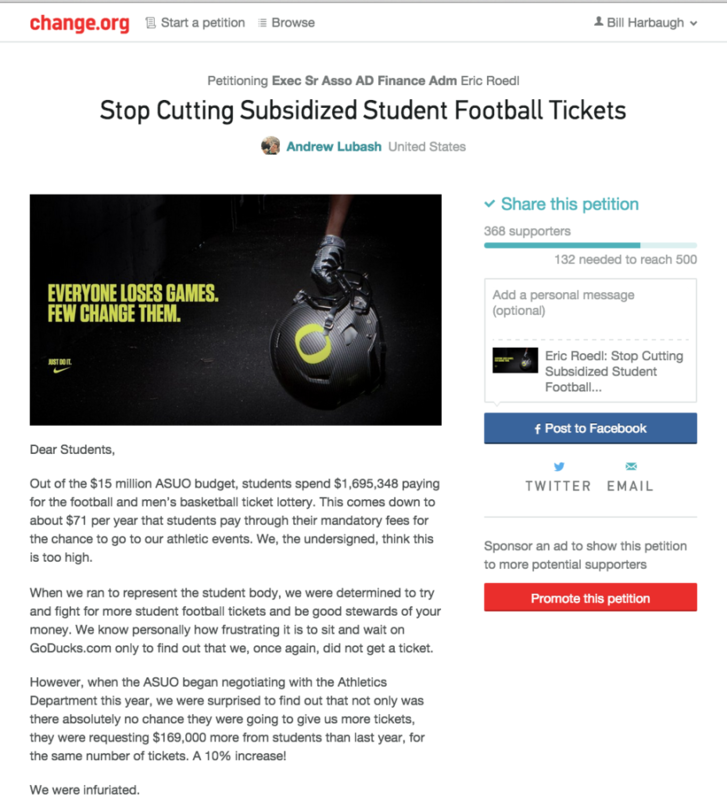 For background on the AD’s efforts to squeeze ASUO for more student money see here, and for more on the hidden subsidies for athletics see here. Short version: The Ducks have hit price resistance from their regular fans, so they want to raise the fee to student government to ~$80 per student, to provide “free” tickets via a lottery. This is the second meeting of the ASUO committee that will recommend yes or no. The first meeting is described below. As usual, our students run an excellent meeting and the discussion is very polite, direct, and well informed. After getting a thorough shellacking by the students, he doesn’t show up this time. In fact he already’s dropped down to asking for a 3% increase. The students are skeptical of even that. Many ask why any mandatory student fee money should go to athletics. Their most favored option seems to be to move to a model where students can opt in to pay a voluntary feee to athletics, for a lottery for football tickets in the same student section as now, and free tickets for basketball and other less popular sports. The voluntary fee would be higher, but only those wanting to go to games would have to pay it. 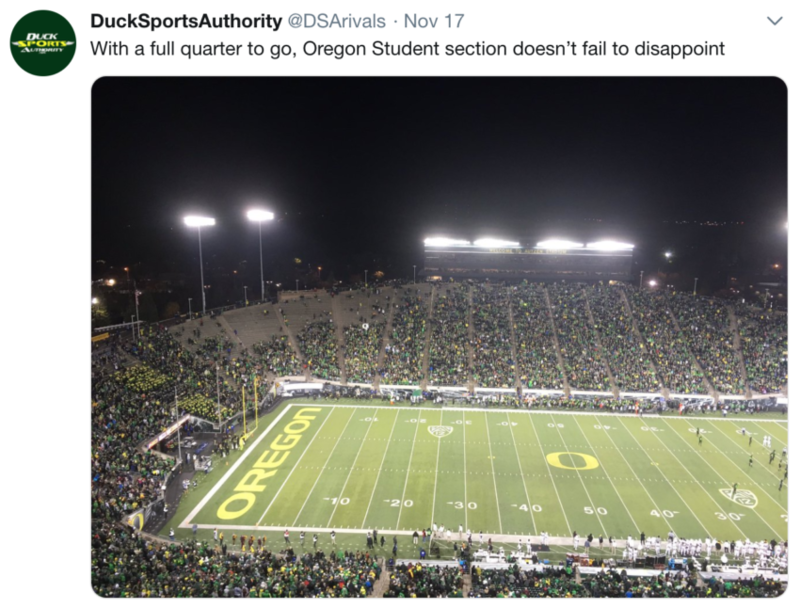 The athletics department likes the current system, because it isolates them from the free-market, and hides the true cost of the tickets from UO students. (If you ask students, most will tell you they pay nothing for the chance to enter the ticket lottery. They’re quite surprised to learn how much it really costs.) This change would take a while to implement however. As the discussion evolves it turns out that the Ducks aren’t just making ASUO pay for the tickets, they’re also adding on a DAF “donation fee”. Wow – is this whole scheme legal? I’d check the legal opinions from UO’s General Counsel’s office, but I had to give those back. Bummer. In the end, of course, Roedl discounts everything, perhaps to account for the fact that the IRS deduction on the “donation” isn’t worth anything to student government, but most importantly because student demand is pretty price-elastic, so a bit of price-discrimination is profit maximizing for the Ducks. A committee member proposes a cut from $1.6M to $1.3M, for the same number of tickets, instead of the increase to $1.8M Roedl was shooting for. Roedl’s response, by email, is to try and confuse the students with some accounting jargon. Student question: What might Roedl and Mullens do if ASUO cuts the subsidy – would they cut the student tickets off? No more tickets for any games? Oh My God! Fat chance. Their salaries depend on being able to credibly claim the Ducks are part of UO’s academic mission – no students, no IRS tax deductions for the donors, and taxes on the ESPN money etc. That’s the death penalty for college football – or at least a big salary cut for some well paid AD employees. The AD budget is apparently $98M. The $300k we’re talking about here is roughly one day of revenue for them. Their revenue went up about $10M last year. This money is a a rounding error to them. Lubash: I have a problem with requiring students, many of whom are borrowing money to pay their tuition and fees, to pay the athletic department money $71 a year for a chance to buy a ticket that they might not even want. Yes, I ran on a platform of getting more tickets – and on fiscal responsibility. The athletic department is not going to agree to more student tickets. So lets at least reduce the cost of the tickets that we can get to see our favourite teams such as montreal canadiens tickets. At around 4:45, after a lot of well considered discussion, the committee votes 4-3 to recommend to the full ASUO that the fee to athletics be cut from $1.6M to ~$1.3M. If AAD Eric Roedl doesn’t like it, he’s 72 hours to put together an appeal and bring it to the committee on Monday. So stay tuned! 2/6/2015 11:00AM: 2:30-4 in Chapman 204. See below for background. Rumor has it that AAD Eric Roedl might not show. He got angry about having to answer questions from students last time. Just like he got angry about having to answer questions from the faculty last year, and stopped coming to the IAC meetings. Here’s the agreement between Johnson Hall and Athletics, to divert academic money towards the “presidential skybox” at Autzen, etc. That’s right, UO students pay for the administrator’s football skybox. 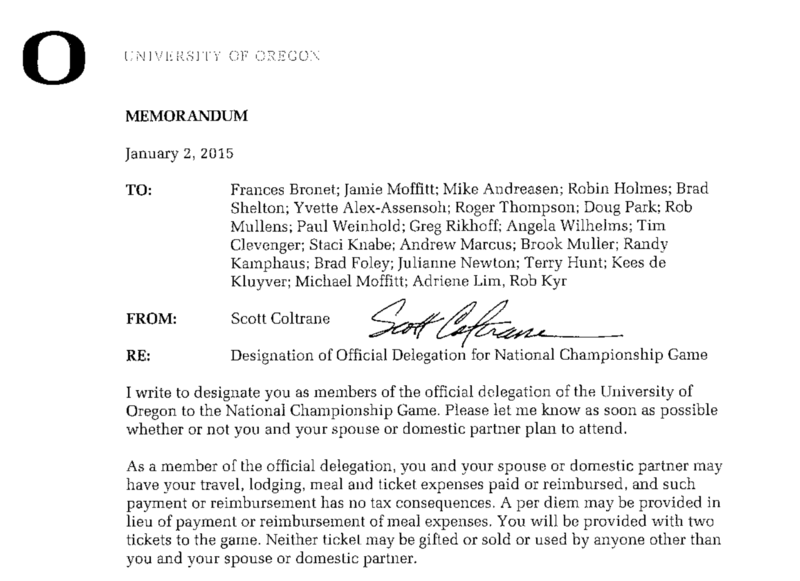 It took a petition to the DOJ to pry this document out of UO – now it’s on the AD’s website, here. Semi-live blog. Usual disclaimer, nothing is a quote unless in quotes. Short version: The Ducks have hit price resistance from their regular fans, so they want to raise the fee to student government to ~$90 per student, to provide “free” tickets. 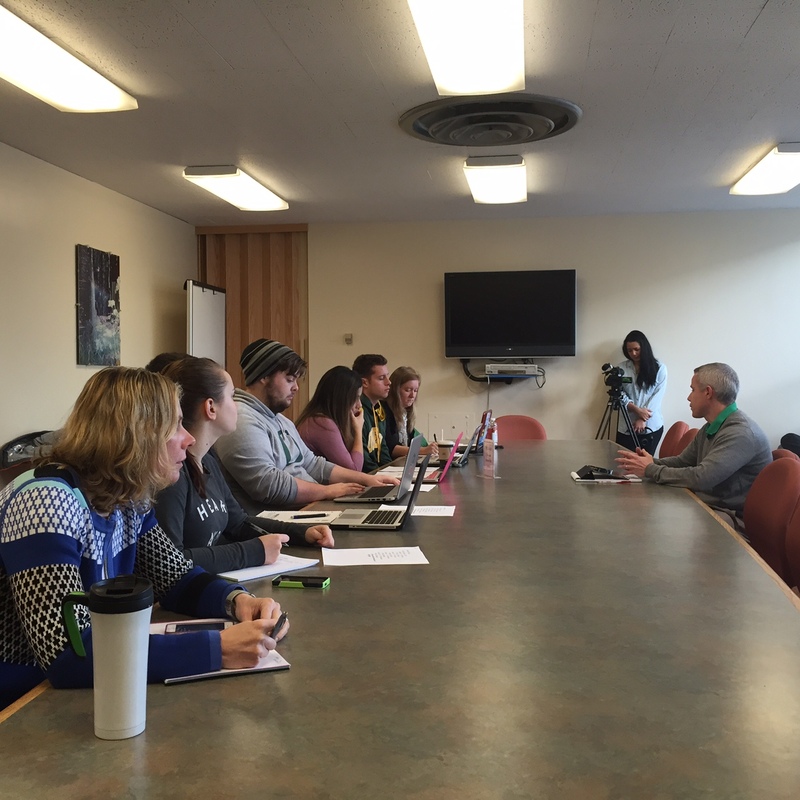 This is the meeting of the ASUO committee that will recommend yes or no. As usual, our students run an excellent meeting and do a very professional job putting tough questions to AAD Eric Roedl. Andrew Lubash, Student Chair, many student Senators, and Eric Roedl and Laura Gordenson (? ), AAD for ticket sales, plus a few other AD minions. 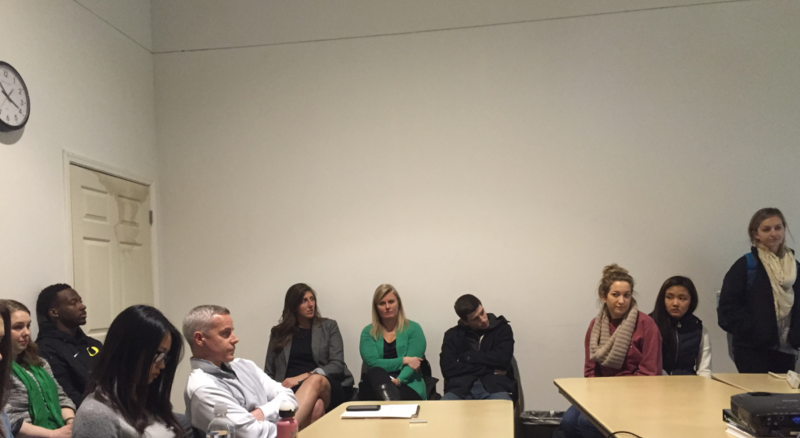 Roedl makes his pitch: Culture of excellence … Exceptional student athlete experience. School spirit and pride. 100K students interactions. Room fills up with students. Roedl: “I don’t know how many of you were at Rose Bowl…”. Ticket Agreement. We want to have “best student support” Benchmark is we want to charge students 50% of regular season ticket price, it’s now only 41%. Repeats claim that athletics is self-supporting. Leaves out hidden subsidies. ASU voted new student fee. $100. Proposal is for a 10% increase in fee, from 41% to 45% of season ticket price. Student: What about all your new money from ESPN? Lubash: Student government has 5% cap on fees. Athletics is our biggest expenditure. CSL: Current Service Level. So when you say 10% you are saying it costs 10% more to provide same # of tickets. Is this accurate? Lubash: Every other contract we require a CSL contract. You didn’t. You’re just trying to catch up to the 50%. I think it should be less. Students should be getting a significant discount to go to our own team’s games. Student: True of all groups we spend i-fee money on. Student: I did some research. ASU’s student government will get 1/4 of the football tickets for students. We get 8%. Roedl: Supply and Demand. Lots of empty seats though. Student: What do you do with the tickets that ASUO pays for but the students don’t use? Looks like you resell them? AAD: Rare that we resell football tickets. Lots of basketball games though. AAD: Whatever we can get. Student: Student fees go for the tickets, then you resell them and keep the money? Roedl: If we ever sold out Knight Arena, it might happen. But that’s a pipe-dream. Student: Tell us more about how you set your budget. Roedl: Every year we balance our needs with the available resources. Everything left over goes to our exorbitant salaries. Roedl: It’s complicated, every campus uses a different model to hide the true cost of athletics. Student: What would you do differently if we only gave you a 3% increase? Roedl: We’re open to changes, every little bit helps though. Hansen: You need the students showing up at your games so ESPN can put them on screen. Not a college game without them. You should pay the students to show up. Roedl: We need the money. Iverson: The opportunity cost of every $ athletics gets is a $ some other ASUO program won’t get. Many other deserving student programs. Lubash: We need to come out with a number. I want to keep the number of tickets the same, or even increase it. But I haven’t seen any evidence from the AD why fees should increase. It now costs our students $72 a year just to get a chance to enter the lottery. Students somehow think it’s free. We need to see some reasoning behind this increase. You need give a positive economic argument about costs increases, not a normative, ideological argument that 50% is fair. I’d reply that 33% is fair. Roedl: Tries to argue that ticket prices are the opportunity cost, then changes his mind. (But regular ticket prices have leveled off). Lubash: You haven’t shown us the numbers to justify this increase. If you were me what would you do here? Students continue to beat up on Roedl. He looks like he’s willing to give the tickets away, if they’ll just let him out of the room. ASUO President Gutierrez: Appreciate how passionate people are about Ducks, that’s why I am suggesting 3% increase. AD should be able to find the extra money themselves. Student: Proposes that we schedule another presentation from the Athletics Department to get them to present more specific budget numbers to justify their requested increase. Senator: We should be paying zero. This is ridiculous. Dusseau: Lack of transparency from the athletic department. AD has the resources to pay for this themselves. If not, get the money from the bloated JH budget.